Glen Gray (June 7, 1906 – August 23, 1963) was an American jazz saxophonist and leader of the Casa Loma Orchestra. Gray was born to Lurdie P. and Agnes (Gray) Knoblauch in Roanoke, Illinois. His father was a lifelong railroad worker who died when Glen was two years of age. His widowed mother married George H. DeWilde. Gray graduated from Roanoke High School, where he played basketball. He is said to have joined the Army at seventeen, and two years later he was living at home with his family. He was employed as a bill clerk for the railroad. He attended Illinois Wesleyan University, where he joined Tau Kappa Epsilon fraternity, but left to work for the Santa Fe Railroad. 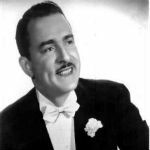 Gray attended the American Conservatory of Music in 1921 but left during his first year to go to Peoria, Illinois, to play with George Shaschert’s orchestra. From 1924 to 1929, he played with several orchestras in Detroit, Michigan.